For anyone who works a 9-5 shift or any other shift for that matter, the expression ‘TGIF: Thank God it’s Friday’ is both a celebration and a prayer. It is our way of heaving a sigh of relief from the exhaustion of our long commutes, waking up at unholy hours and going through the motions of gruelling work days of earning a ‘living’ with tears, sweat and blood! We look forward to Friday as a beacon of light, a door into a 3-day safe-house, a weekend rest zone, where we revitalize, relax, rejuvenate and re-deploy new strategies on how to use our energy, hearts and heads for yet another week of meetings, presentations, productivity and performance measurements! And we often get so caught up in the rat race of survival and we sometimes forget to focus on the other more important race, the sacred race of our eternal existence. This IS the race that will determine how your life story is told, re-told and remembered. We forget that no matter how much we love our great jobs, businesses or careers, they can never love us back. We sometimes lose focus of our purpose here: to shine our light on everyone we meet, to connect meaningfully with ourselves, loved ones, family members, friends and strangers. And to honour and serve God and others with everything we’ve got – our skills, talents, gifts, abilities and passions! This week, the TGIF proclamations are like no other. Today is Good Friday and in fact, to me, it is the greatest of Fridays! 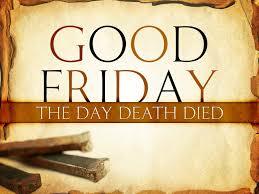 Regardless of faith and creed, it is a day for true celebration of faith, hope, grace and the promise of salvation. Most of all, it is a celebration of unconditional love and journey of an ordinary life towards an extra-ordinary, eternal life. It is a re-awakening of our senses to revisit the sacrifice of God’s begotten son. It is a season of reflection on how we can CHOOSE to design and co-create an authentic life and not merely how we can earn or make a living! Today, as we celebrate Good Friday, let’s reflect on the ultimate sacrifice of love and life gifted to us by God’s begotten son, Jesus Christ. Are you still living your life as if all hope and light were lost? Do you think there are no solutions to your challenges and problems? Are you eating crumbs off the table of life, blind to and oblivious of the special banquet and beautiful feast already laid out specially for you? Everything we seek is already imbued within our being. Seek deeper and reach farther, really explore the world within and around you. This is a time to reflect on the sacrifices made by your loved ones to get you where you are today. In particular, it is a day to be thankful for all the heroes and soldiers of freedom and democracy, who gave their lives that we may live with dignity. Are you making life only about YOU? Are you living your life selfishly, without paying it forward? Who are you sacrificing for? Who are you shinning a light for? In every sphere of your life (Family, Relationship, Health, Career/Finance, Spirituality, Social Responsibility etc. ), everything that is dead or broken is made alive and whole by the salvation of the CROSS! Everything you need is already within you! It was given to you as a gift over 2000 years ago. You have to dig deep to activate the switch of manifestation. You are created in HIS image and likeness. Therefore, be certain that your life comes with a promise: Whatever you seek, you’ll find. HIS grace is SUFFICIENT for you, always! However, you must first take the time to know yourself, to know whose you are and whom you are. Have clarity on what you actually seek. Have a reflective Good Friday, bask in the awareness that you are loved unconditionally and completely. It is indeed the greatest of all Fridays! Celebrate the beauty of this Agape Love, reflect on the passion of the cross and enjoy the freedom and salvation granted by God, our creator. P.S: During this season of lent and Easter, I’d like to share a quote from the Pope, aptly named after Saint Francis of Assisi. Pope Francis is inspiring the world by showing us the hidden beauty and grace of a life of simplicity, charity and humility. “We have to learn to be on the side of the poor and not just indulge in rhetoric about the poor! Let us go out to meet them, look into their eyes, and listen to them. The poor provide us with a concrete opportunity to encounter Christ himself and to touch his suffering flesh.” ~Pope Francis (From his book, Walking with Jesus). Let us reflect upon these words and realize that ‘the poor’ are not just those who are lacking in material goods and basic needs of survival, but also those who are poor in spirit or faith, poor in understanding (and rich in ignorance), poor in integrity and ethics, poor in love and poor in peace (i.e. filled with hatred and anger), and even those who feel unloved, unwanted and unworthy; poor in the awareness that they have something unique to offer the world. Offer yourself in service and rise with risen Christ as you share a gospel of love, hope and salvation. “Lord, make me an instrument of your peace, Where there is hatred, let me sow love; Where there is injury, pardon; Where there is doubt, faith; Where there is despair, hope; Where there is darkness, light; Where there is sadness, joy. Beautiful post Juliet! I’ve been to Assisi myself and I can say that the life of this blessed St. Francis of Assisi still inspires me up to today especially when I am caught in the rat race of the world. However I am going through issues with your RSS. I don’t understand why I cannot join it.